FORT WAYNE, Ind. (WANE) - A Fort Wayne firefighter is facing three felony charges, arrested in a domestic battery situation Thursday night. According to court records, Matthew Brown, 30, is charged with domestic battery, a misdemeanor, and pointing a firearm at another person, criminal recklessness with a deadly weapon and intimidation where defendant draws or uses a deadly weapon, which are felonies. In a probable cause affidavit filed Friday, police said Brown threatened to shoot his girlfriend with a loaded weapon after beating her inside and outside a home in the 2600 block of Canbury Drive. When police arrived at the home, they reportedly found clumps of hair on the front porch, the affidavit said. Officers then spoke with a woman, who said she'd gotten into a verbal argument with Brown and he'd pushed her to the ground and she then threw her cell phone at his truck, according to the affidavit. From there, the woman said Brown grabbed her and punched her in the face before he pushed her to the ground again. As the woman tried to go into the home, she said Brown closed the door on her leg, the affidavit said. She also said Brown pulled her hair and pulled hair extensions from her head, the affidavit said. Inside the home, the woman told police that Brown went to a bedroom and got a gun, then pointed it at her and said, "I am going to (expletive) kill you," the affidavit said. The woman said she was eventually able to leave the home, and she called 911. Police found a loaded handgun in the home with a bullet in the chamber, according to the affidavit. A witness told police that he saw the fight unfold and saw the battery, according to police. Police noted in the affidavit that the woman was afraid and fearful and complained of pain. She was not hospitalized, according to the affidavit. NewsChannel 15 has learned that Brown has been on the Fort Wayne Fire Department for a little more than a year and is a private. The fire department said he was hired in November 2016 and is an apprentice level firefighter. That means he's passed his probationary year, but has not yet completed the three-year journeyman program. He has not had any past disciplinary issues on the department. Brown is currently on paid leave from the department, but the department said it can't comment further on disciplinary actions. According to his Facebook page, Brown is also a firefighter with the 122nd Fighter Wing and is an active member of the Air National Guard. It has recently come to our attention that Tech. Sgt. Matthew Brown, was arrested from a domestic battery situation, while in a civilian capacity and not on military orders, Thursday night. The 122nd Fighter Wing will cooperate with all enforcement agencies concerning this matter. We cannot speculate at this time on the actions that may or may not be taken in regard to Browns National Guard membership and cannot comment further on any disciplinary actions pending outcomes of charges levied upon Brown. The Fort Wayne firefighters Local 124 will cooperate with all law enforcement agency requests regarding this matter. We are unable to comment on any continuing investigation and will provide additional information as it becomes available. 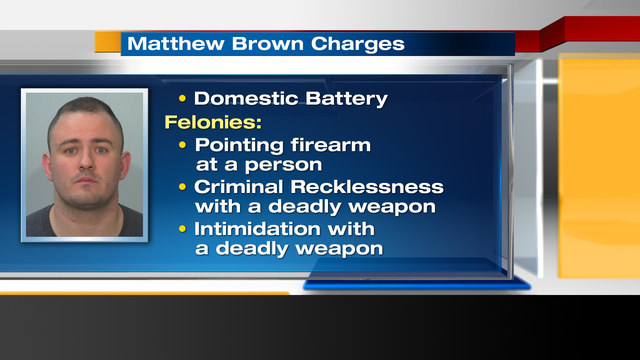 Brown bonded out of jail on Friday, but there is a protective order issued against him. He's due back in court on March 7.